Meadow Brook Hall operates as a historic house museum and cultural center that strives to preserve and interpret its architecture, landscape, and fine and decorative art so that visitors may be entertained, educated and inspired by history. Meadow Brook Hall is the historic home built by one of the automotive aristocracy’s most remarkable women, Matilda Dodge Wilson, widow of auto pioneer John Dodge, and her second husband, Alfred Wilson. Constructed between 1926 and 1929, Meadow Brook Hall represents one of the finest examples of Tudor-revival style architecture in America, and is especially renowned for its superb craftsmanship, architectural detailing and grand scale of 88,000 square-feet. It was the center of a country estate that included 1,500 acres, numerous farm buildings, recreational facilities, several residences and formal gardens. Named a National Historic Landmark in 2012, today Meadow Brook Hall operates as a historic house museum and cultural center that strives to preserve and interpret its architecture, landscape, and fine and decorative art so that visitors may be entertained, educated and inspired by history. The staff and volunteers at Meadow Brook Hall interpret its rich history and deliver world class service in sharing the family's stories with the community while immersing them in history through tours, educational programs and community events - allowing patrons to step back in time and experience the Great Estate. Meadow Brook Hall accepts donations. Donate Now. 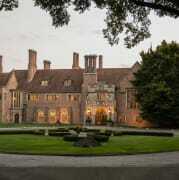 Would you recommend Meadow Brook Hall?